It can be a daunting task to find the right LED grow light. As most companies claim and don’t provide, you never know what to believe. However, G8LED has only focused on providing the best to vegetable and plant growers. Many famous plant and vegetable growers have endorsed the G8LED G8-600 already. 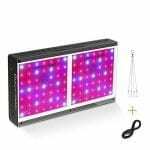 This is a full spectrum LED grow light that is used for indoor plant growing. It is one of the best light for indoor growing. 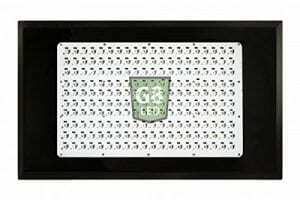 The G8 LED G8-600 uses a design that gives maximum coverage and the best yields. Most of the growing lights that have a large coverage area use a high-power bulb, but this one only uses 380 watts of LED bulbs. Perfect for energy saving! For every LED grow light, the number of plants it can grow is mentioned. For the G8LED G8-600, it is a total of 10 plants. Which means that it can help nourishing and growing 10 grown-up plants. For the best possible results, ideally, you should use one G8LED G8-600 for 5 to 7 plants. With this in mind, let’s discuss the whole G8 LED G8-600 review. 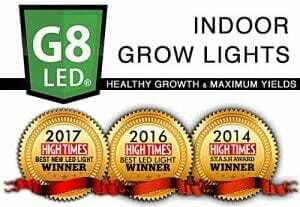 The G8LED G8-600 has been awarded by high times grow magazine for being the best indoor growing light. 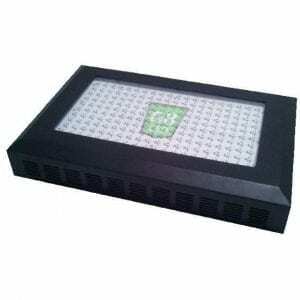 This is due to its premium features that are added to this indoor growing light. The nourishing quality and the cross coverage of the light can be played with and modified for a better result by adding just a few simple accessories. The penetration of this light is at least 60 inches into the canopy of the plant, which helps in nourishing the leaves inside out and helping the plant flourish and grow. There are small infrared diodes present in the G8 LED. Infrared light is extremely important for plant growth, especially for the growth and nourishment of the leaves. Hence, the infrared diodes present in the lights provide invisible light for the human eye. The best part is that this light is eco-friendly (and budget-friendly)! It helps in saving a minimum of 600 watts per hour which is equal to 50,000-hour lifetime saving. There are two types of costs in every product, one is the buying cost and the other is the working cost. What worry the users are the working cost and the energy efficiency of a LED grow light. G8 LED claims that the G8-600 operates at a maximum of $1 per day. Now, how reasonable is that? That’s what we wonder. This kind of energy efficiency and cost efficiency is unmatchable on the market. Another thing that is part of the working cost is the maintenance of the product. Fortunately, the G8LED G8-600 does not require high maintenance and you will need to change the bulb only once in 8-10 years’ time. G8 led makes use of great parts in their lights to give them a maximum lifespan. This light is designed after 8 whole years of research. This is why the spectrum range devised for this light is very efficient. It really helps your plants grow better! All the diodes used in the light are used to benefit the photosynthesis process. There is not a single diode that is being wasted. The design is made such that there is a perfect balance in the penetrating power as well as low heat production and exposure. High-end components used for the light. Warranty of two years and 90 days money back guarantee. It has 8 bands of light and covers a total area of 20 square feet. This light can stay put for as long as 10 years, you don’t have to change the bulb again and again. Awarded by high times magazine! If you are a hobbyist and a plant grower who is looking for something amazing to help the plants grow, then there is nothing more efficient and ergonomic on the market. Even though the initial cost is high, you will not regret buying this piece of art. An amazing grow light that really increases your yields. G8LED did a great job on producing this G8-600. A must-have for the high-end grow room! 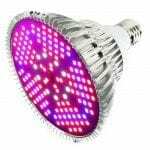 Are you looking for a premium-quality LED grow light? Then you should also read the review of the California Lightworks SolarSystem 550. Looking for a bigger version of this light? 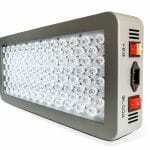 Check out our review of the G8LED 900 Watt G8-900 grow light.